There isn’t one right answer for what to do post-run as far as movement. But from a functional perspective, dynamic stretching after a workout can help prevent injuries. 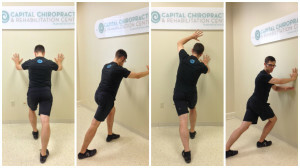 Dynamic, or triplanar stretching, moves your muscles in all directions. Dynamic Triplanar Calf Stretching can be a great way to warm up, cool down, or to include in your standard stretching. Dynamic Stretching differs from Static Stretching in that we want to move in and out of the end range of the stretch, repeatedly. Meaning, we may look at 10 reps with only a 1-2 second hold during the stretch. As you can see in the first two images, we first look at stretching in the sagittal plane, or directly forward and backward. We find that this looks a lot like the standard calf stretch that may already be a part of your standard routine. The last image, we look at rotational movements, or stretching in the transverse plane of motion. Repeat the dynamic stretch 10 times in each plane of motion. Repeat on both legs. In addition, with you knee most extended/straight you are stretching mostly your gastrocnemius muscle. Consider bending your knee to target the soleus muscle.